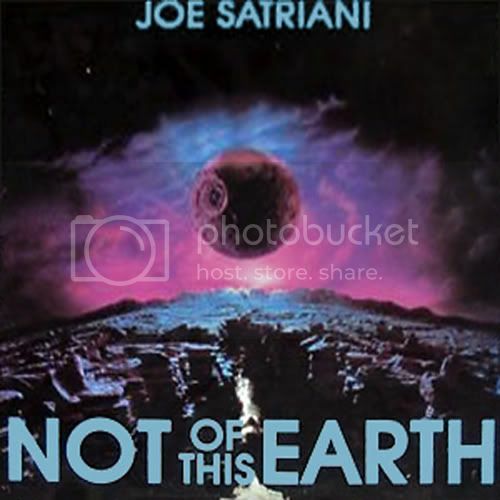 What Is The Best Joe Satriani Album Of All Time? 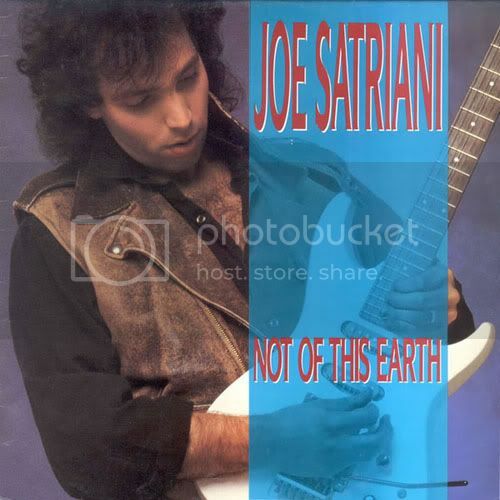 Not Of This Earth, the debut of Joe Satriani. 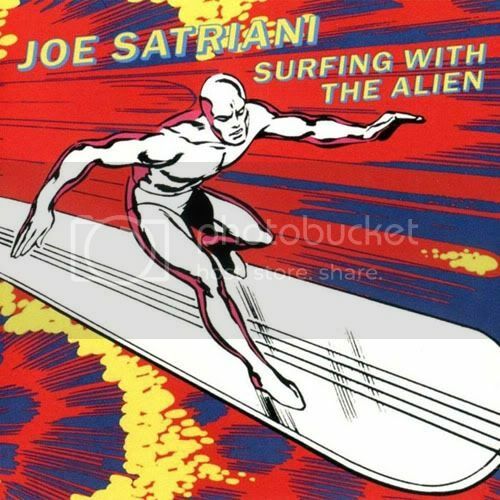 I, like pretty much everyone else on the planet, was introduced to Joe with Surfing With The Alien. So it was after that masterpiece that I started to do reseach on him and came across NOTE. Upon my first time playing through the album, it was in stark contrast to what I had soaked up on Alien. 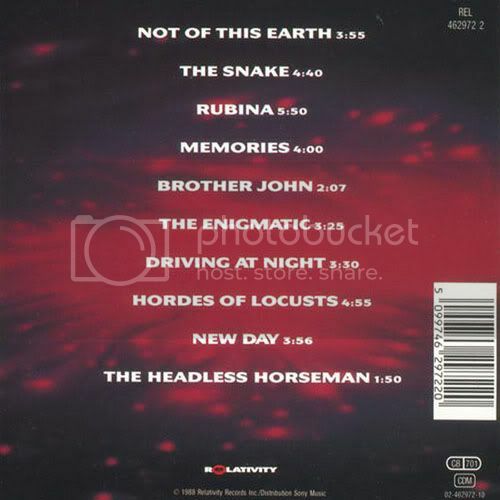 NOTE is a very eclectic record full of experimentation. And even though it was nothing like his follow up, it was worlds apart from every other dime-a-dozen shredder that had a record deal out at the time. What set Joe and this record in particular apart from his contemporaries is that he was doing something completely original. 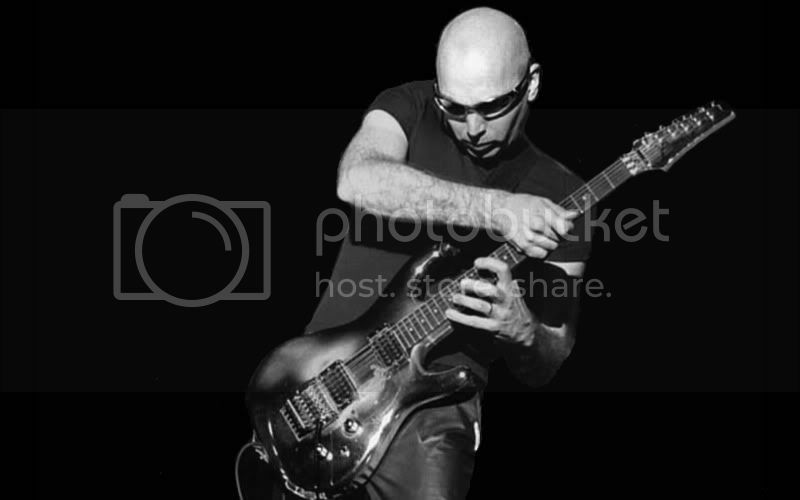 While everyone else was doing their best neoclassical spin on Yngwie Malmsteen, Joe was pushing himself and the instrument further, especially in the way he recorded and played whatever he had on hand to suit his needs. I picked this album apart like you couldn't believe. This was right around the time that I started playing guitar myself and wanted to learn as much as possible. Not to demean the songs, but they were very straight forward when it came to rhythm for bass and drums, that I literally went song by song and recreated all the parts using my drum machine, bass and 4 track recorder so that I would have my "backing band" to start learning the guitar parts. That's why Not Of This Earth is special to me, in spite of it not being a perfect record, which it is not. But it holds up pretty well after all these years. Sidebar: The original Space/Planet cover is now fetching on some sites upwards of $200 for the Vinyl in mint condition. If you guys come across it, I suggest you pick it up if you can get it for cheap. 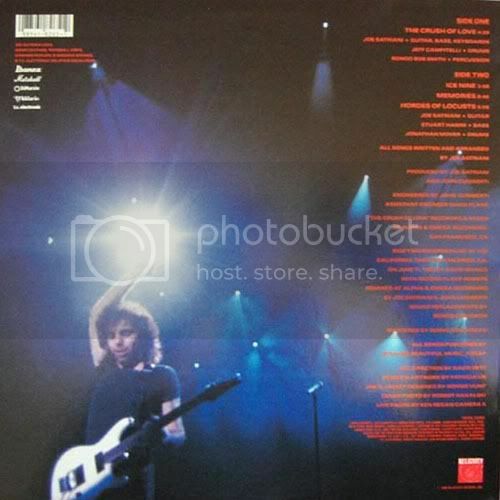 It's out of print and probably one of the LP's I will never sell. At least for the time being anyways. Surfing With The Alien, the one that started it all for me....and the rest of the world. Yes, it was his second album. But no one even knew about Not Of This Earth, myself included. It's funny how I discovered Joe for the first time. I was driving late one night (around 11pm), when Steve Vai, who was in town that night had an interview on KGB 101.5 radio. During the interview, the question of how he started playing guitar obviously came up. That's when Steve named dropped Joe and was raving about this guy. He was laying it on so thick that I was beginning to think he was making a joke out of it. So he goes on to tell the host and radio listeners about Joe's new album, Surfing With The Alien, and to go check it out. I immediately did a U-Turn and headed straight to Tower Records. I had time left as Tower stayed open till midnight. I went down and picked it up and nothing has ever been the same again when it comes to 6 String Gods. I remember playing it non stop till at least 3am that night. How does it hold up today? It's even better now. Fave Songs: Surfing With The Alien, Ice 9, Crushing Day, Satch Boogie, Always With Me, Always With You and Echo. My first introduction to the man that I also would worship one day....John Byrne, the Comic book God himself who did the artwork of Silver Surfer. So, Album cover ftw!!!! This album gets 10 Stars which means you should own it. I got a soft spot for this one in particular for one reason and one reason only. I'm on it!!! No lie!! Dreaming #11 is an EP of 4 songs. 3 live tracks were recorded at the historic California Theater in Downtown San Diego during the Surfing With The Alien Tour. The 4th song was a brand new song called The Crush of Love. Ok, enough with the praising. I give Dreaming #11 the rating it gets for the simple fact that it's incomplete. Not only that, the entire concert exist. How do I know? The night of the show, KGB 101.5 broadcast the entire show live, which I had the good sense to have a friend of mine tape direct off the radio while I went to the show. And let me tell you...the sh*t that's on that audio tape is f*cking insane. The best, and I mean absolute best parts never made it onto the album. I really don't understand why they didn't just release the entire show as is instead of making it an EP. I understand that the record company wanted to throw something out into the market to capitalize on Joe's now legendary status as Guitar God. But if they can make an EP, why not a full LP? As for the new song, The Crush Of Love, it wasn't even "new" at the time. 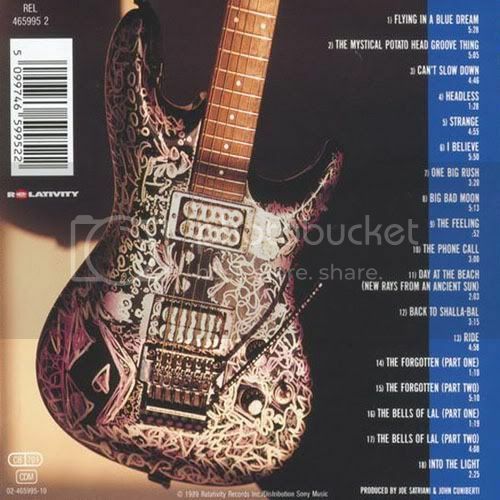 It had appeared in the pages of Guitar World Magazine earlier that year as a free flexi-disc, which I still have to this day. Fave songs: The sh*t you don't hear. Seriously, this version still gives me goosebumps. 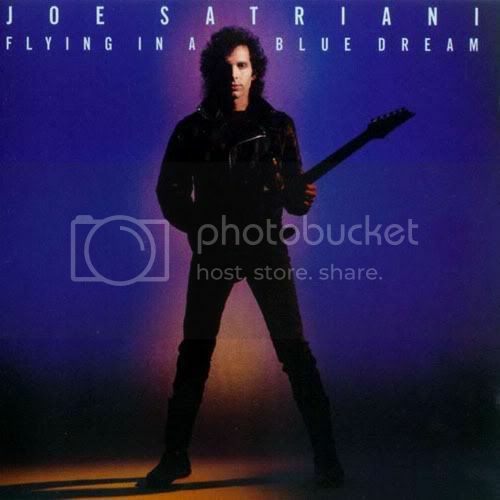 For years, since the day it came out, I have been touting Flying In A Blue Dream as the best Joe Satriani album there is. But while in the midst of my marathon, I may have to rethink that notion, not because it's flawed, but in that having just finished listening to Surfing With The Alien, I'm finding it extremely difficult in choosing what is "the best" in his entire catalog. I'm gonna have to hold off till the end of the marathon before making my selection. Hell, I still have The Extremist to listen to and that's right up there with the best of 'em. 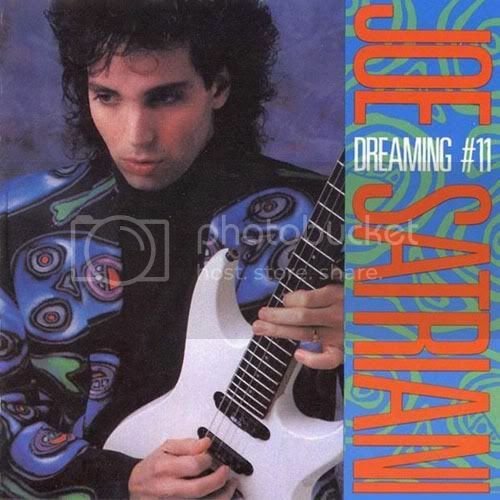 I can say this though, this album still has the greatest instrumental guitar song of all time: Flying In A Blue Dream. No brainer there. And for those that say that Joe can't sing, all you need to do is listen to I Believe and not think that is a beautiful song. Sure he's not the greatest singer there is. But he pulls it off well enough to not embarrass himself. Ride probably has the best groove on the entire album. As for the entire album, it clocks in over an hour, almost double the size of his last studio album. And it couldn't be further in style and execution. The dude even made playing the harmonica and the banjo cool. This is no Surfing Part II, which says a lot more about him as an artist and songwriter and not feeling the need to throw out the same thing for a quick buck. Fave Songs: Flying In A Blue Dream, The Mystical Potato Head Groove Thing, I Believe, Big Bad Moon, The Phone Call, Back To Shalla-Bal, Ride and The Forgotten (Part Two). The Extremist. The core of the group here is Joe, Matt Bissonette (David Lee Roth) on Bass and Gregg Bissonette (David Lee Roth) on Drums. 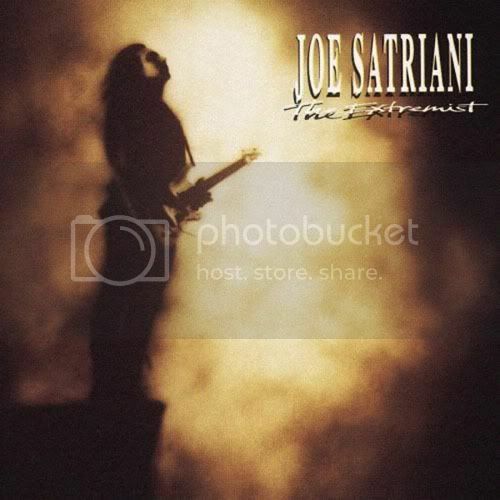 This use to be one of my all time favorite Satch albums. But over the years it has lost some of it's appeal. It may have to do with the fact that they overplayed the best song on the album. That song of course being Summer Song. I mean, f*ck, it was everywhere, attached to everything. As for the rest of the album, there are still some fantastic songs that I find myself listening to over and over. But as a whole I think it just hasn't aged as well as Surfing With The Alien. Whereas that one is timeless, this one does sound a bit dated in some spots. And where Flying In A Blue Dream took his playing farther than it had been, this one lacks those instant classics he is known for. 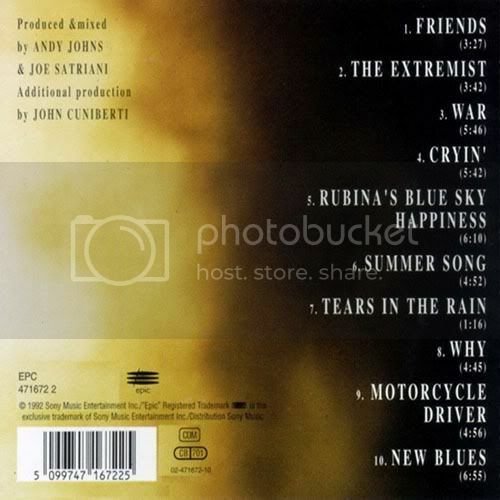 Fave Songs: Friends, War, Cryin', Rubina's Blue Sky Happiness, Summer Song and Motorcycle Driver.